One year ago today, I started this series with grainy photo of a presumed stray I nicknamed Scruffy. The plan was to post pics I had recently taken, and to add a few more, before wrapping up within a few weeks or as long as a month. 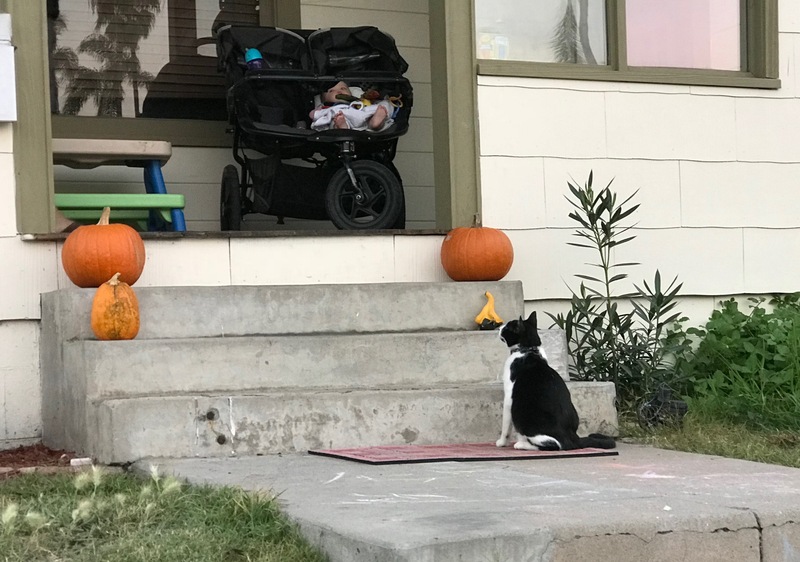 I had no concept of the number of kitties that there were, or are, around the neighborhood—more than 100 featured so far. 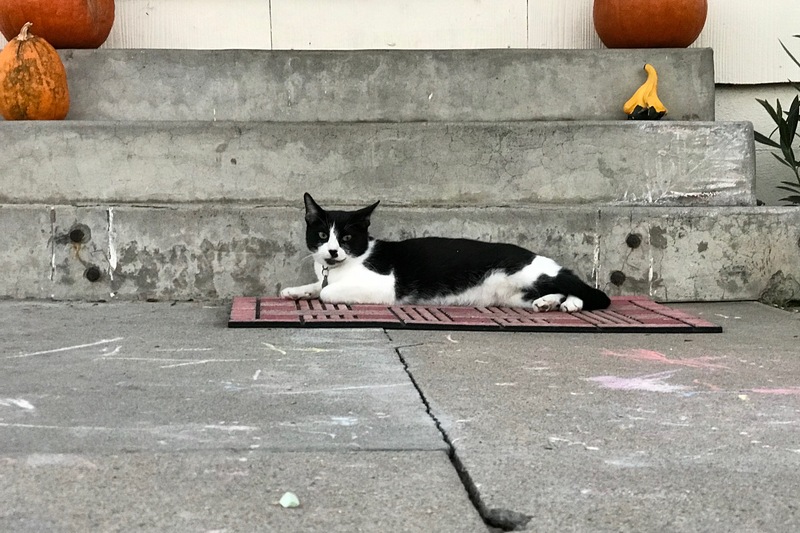 We celebrate the anniversary with Captain Blackbeard, who yesterday evening relaxed on house steps below a sweet, 6-month old girl and her friendly dad. “He came with the name”, the gent said about his pet, observing that the beard is more white. The feline spends more time indoors, but gets occasional outside romps, and he has been with the family for about 3 months. I captured the moment at 6:19 p.m. PDT using iPhone 7 Plus. I had gone out with intention of driving to Target, but the evening was so pleasant I decided to walk instead. That’s why the Leica Q, which would have produced cleaner, low-light portrait, wasn’t in tow. Sunset was six minutes earlier. I met Captain Blackbeard and (part of) his family where Meade and North Avenues meet. The Featured Image is a lucky poignant portrait. Its companion is more fitting for the Halloween season. Vitals for the first: f/2.8, ISO 250, 1/60 sec, 6.6mm; same, but ISO 400, for the other. A year of cats: Scruffy, Roly Poly, Woo, Skull, Biscuit, The Colonel, White, Chipper, Frisky, Stretch, Needy, Farfisa, Mates, Hunter, Pee-Pee, Blue, Blue Too, Bonded Pair, Patience, Fess, Jumper, Frenemy, Looker, Cozy, Scout, Lurks, Skit, Mini, Betty, Black and White, Stalker, Bell, Chill, Sammy, Scratch, Poser, Star, Grey and White, Watcher, Herman, Comet, Roman, Willow, Chub, Nimbus, Watson, Lilo, Kit, Pepe, Twilight, Sebastian, Spot, Booger, Ash, Veruca, Riley, Mellow, Bonde, Flower, Glass, Black, BeBe, Fang, Bruce, Siamese, Pounce, Tortie, Haiku, Fraidy, Peso, Daniel Tiger, Dusk, Stride, Dainty, Spry, Tabby, Betty Too, Still, Levi, Shadow, Sophie, Wink, Ferals, Momma, Charlie, Tux, Cool, Benny, Jellicle, Itchy Valentino, Goldie, Nine, Amanda, Siesta, ChaCho, Charlie, Too, Mika, Crystal, Seeker, Mittens, Dancer, Smokey, and Monkey.